Take a small group tour of Bangkok's top attractions on this visit to the Royal Grand Palace. 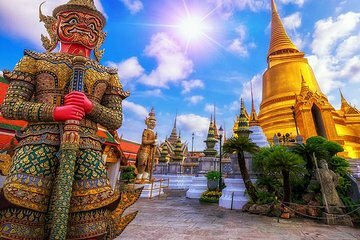 You'll follow an expert local guide to the Temple of the Emerald Buddha and Temple Wat Pho. Round-trip hotel transport is included in this tour, which offers morning or afternoon departures. Wasn't even taken to the Palace at all on this tour, but thankfully the guide and the temples we did see was worthwhile. Viator needs to improve its voucher details and supplier communications as well to avoid this happening again. The Grand Palace is absolutely amazing to see it is high on my list of most beautiful places in the world. The tour guide had proficient English skills and could hold a conversation and answer questions. He was super helpful throughout the tour. There was nobody else on the tour, so this was actually a private tour for us. My only complaint about the tour itself was that we didn't get enough time in the complex to see everything as much as we wanted to. The guide gave us 15 minutes after showing us the buildings to go see everything up close by ourselves. I think 45 minutes would have been much better. I was not super thrilled with the tour company themselves. They sent me 5 emails in the 2 weeks leading up to the tour to confirm a meeting point and emphasize we must be there promptly at 7:30am they couldn't pick us up from our guest house because they couldn't find the address.... So that morning we are rushing to get ready and be at the meeting point on time. We get there a few minutes early and wait. A few minutes after 7:30am, I check my email and at 9:30pm the night before they had sent another email saying we didn't need to meet until 8am and that is when they would pick us up. I know in the grand scheme of things 30 min is not a big deal-- it was just aggravating for them to do that because on international data usage, you can only check email very occasionally, plus they sent it such short notice. Regardless, the tour itself was well worth it. The tour was just ok, what really upset us, was that the tour description in Viator specifically includes a visit to Wat Poh and as soon as we got into the car, the guide told us that it did not. We showed her the tour description on the web, she called her office and still their answer was no: we are not going to Wat Pho. There was only three of us in the tour that actually came together, and not only they told us to blame Viator for misinforming us, but they wouldnt change itinerary and persisted in going to the Gems Factory after Royal Palace...definitely a tourist scam.